Last month we had 56 Pinterest accounts linked up and 36 Bloglovin pages! Make sure you spread the word about the party- the more the merrier, right?? Jaime and I originally brainstormed the idea for a Pinterest linky party when the two of us were emailing back and forth one day after discovering how much of our blog traffic was a direct result of some of our recipe posts being pinned and then repinned and repinned again on Pinterest. We thought why not host a monthly Pinterest party? And thus, Let Me Pintroduce You was born! While you are here, be sure to check out my Giveaways Du Jour Page! :) Today is the last day to get entered for the Digital Crock Pot giveaway and there is also a giveaway for a 12 Inch Cast Iron Skillet from one of my lovely April sponsors! 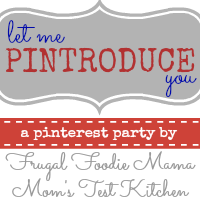 And speaking of sponsors, I would love to have you join Frugal Foodie Mama in May! I am now booking ad spots to start on May 1st! And I am offering 15% off all my remaining ad spots now until April 30th. :) CLICK HERE for more details and for the 15% off promo code! And for this month's party, Jaime & I would like to have a little giveaway to reward those of you who are linking up! :) We will be giving away an ad spot on each of our blogs to one lucky partier this week! Please be sure to link up your Pinterest and/or Bloglovin accounts at the party linkys below (you must link up at least one account to be eligible to win!) and you could be the BIG winner!! So, how does the Let Me Pintroduce You Party work? Easy! Please follow me (Frugal Foodie Mama) and Jaime (Mom's Test Kitchen), and this month's co-host Katie (Clarks Condensed). Grab our button above and slap it on your sidebar or your party page on your blog. Help us spread the word! Be sure to link up your main Boards page of your Pinterest account only, not individual board pages or individual pins. Then hop down to the Bloglovin linky & do the same! *This giveaway is open internationally. All entries for the winner will be checked and verified, so please make sure you are doing what you are claiming in the Rafflecopter or all your entries will be voided. No funny business, folks. ;). By entering you give the right to use your name and likeness. Number of entries received determines the odds of winning. One winner will be selected. Each individual blogger that has provided ad space for the giveaway is responsible for awarding the winner their ad spots in a timely manner. Entries must come from your MAIN social media accounts, not accounts that have been set up separately just for entering giveaways. Entries from these types of accounts will be disqualified. Protected tweets do not count as an entry method for tweeting. Tweets must come from a public account. No purchase necessary. Void where prohibited by law. Thank you for hosting! I am hosting today as well at http://www.frugalfitfamily.com and would love it if you would swing by and link up your party! Now following! So fun! Can't wait to link up!